The island of Ithaki (also referred to as Ithaca or Ithaka) is known as being Odysseus' homeland (Homer's hero who, after the Trojan War, wandered for years before he finally reached his long-lost kingdom). Several archaeological sites associated with Homer's story, along with some beautiful fishing villages and beaches, make this an interesting island to visit. Ithaki is a much-loved island, with scenic beaches and sleepy little villages, and is an ideal spot for an unforgettable vacation. 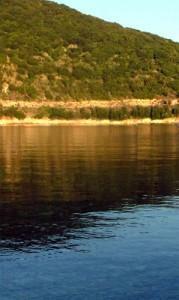 Generally Green, Ithaki is also quiet and scenic and relatively unspoiled by mass tourism. A good, basic accommodation conveniently located right in the harbor of Vathy, just steps from all services, shops, restaurants, etc. The rooms have nice views overlooking the harbor, and this family-run hotel is spotlessly clean. This very nice self-catering option offers fantastic views and a swimming pool, all overlooking the sea, just 1.5 km from the port of Vathy. The large two-bedroom apartment can accommodate up to six persons.